And after twenty five years of trying to figure out how to be a follower of Jesus and His Way, I find I’m getting even more practical in my old(er) age. I find I’m not alone. Many of us are kicking back at how the information age has created a glut of theological theory. We want to be doers of the Word, not just hearers! On Thursday nights I gather with a group of young leaders from different churches in the city. We have dinner together. We worship. We share communion. And we craft and perform experiments. Thursday night has become our learning lab as we wrestle with Jesus’ teachings and how we can put them into practice. His book and his website www.Jesusdojo.com challenge and guide us in our journey. Here was the experiment of the last two weeks. First we meditated upon some of Jesus’ teachings about security and provision, and decided to celebrate as a group how God has blessed us with abundance. Each day we created a list of things we were grateful for. Then we took an offering in the group, and shocked ourselves as we came up with over $1000! With the money, we decided to shower abundance on someone that God had been putting on our hearts. One of us is friends with a single mum who has three teenage girls, two of whom have significant health challenges. The family needs to move, but lacks the resources. We purchased gift certificates for Ikea and Home Sense. We got the mom some spa gift certificates and got each of the girls a mall gift certificate. We put together a gift basket of their favorite foods. We spent the night before delivery praying for the family, and writing messages of love and hope on cards for each family member. We made a video of us sending our love, greetings and blessing to them. And then we delivered it all to their home, along with a commitment to take care of their move for them – the packing, the cleaning, the truck acquisition, and the move itself. Delivering the basket to the family was like Christmas morning, except with more tears. Gotta be the most fun thing we’ve done in a loooooooong time… and we can’t wait to meet next week and reflect on our practice together! 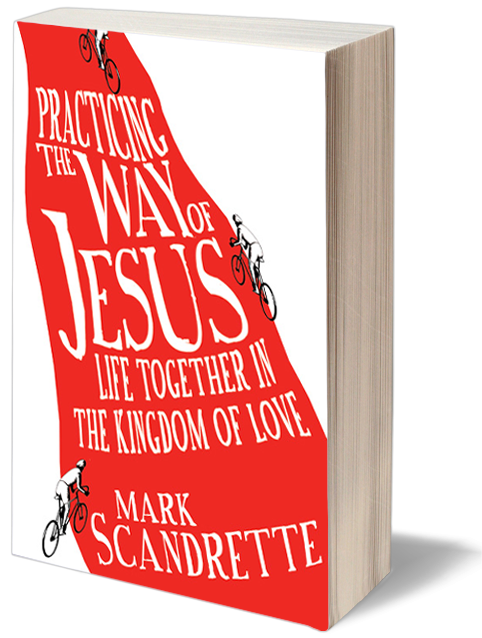 In Jesus’ days, making disciples was learning from teaching AND learning by doing. We are excited about our new Practice, and encourage you to create some experiments of your own! Waiting for a bus. I’m learning to navigate the quirky Hamilton Transit System. After a long wait I discover the Canon bus doesn’t run this early on a Sunday, so it’s the Barton Bus for me. The #2 Barton is always an adventure. Today I learn from a grizzled old Portuguese man how he clung to the side of a high building for 3 1/2 hours when the scaffolding on his work site broke. Four of his co-workers died that day. “Relax, they tell me! Howmy gonna relax!” Again, I meditate on how car ownership has in the past separated me from my community and my neighbors. I feel much more grounded in my neighborhood when walking and taking public transit. I’ve been in the prayer room for a couple hours already. 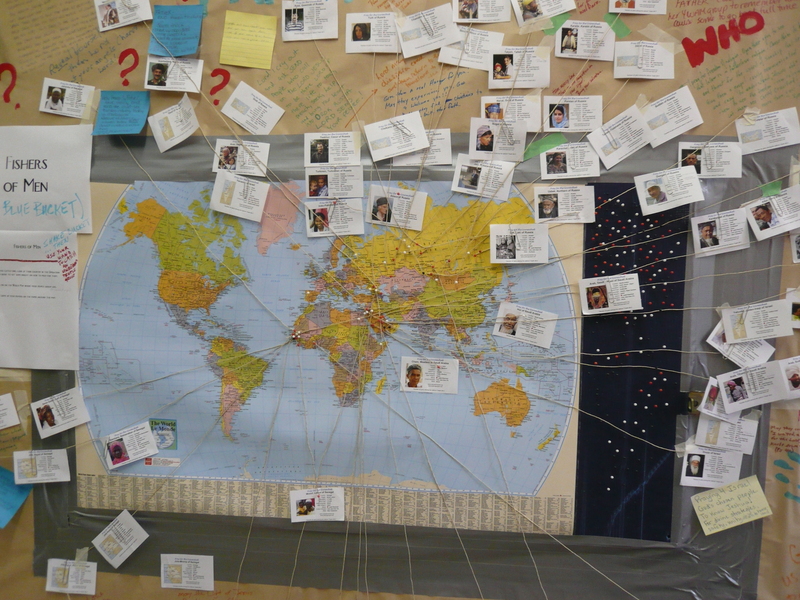 We’re winding up a week of 24-7 prayer for World Missions today, graciously hosted by Wentworth Baptist. A whirlwind blows through the prayer room – well, actually its a Sunday School Class. 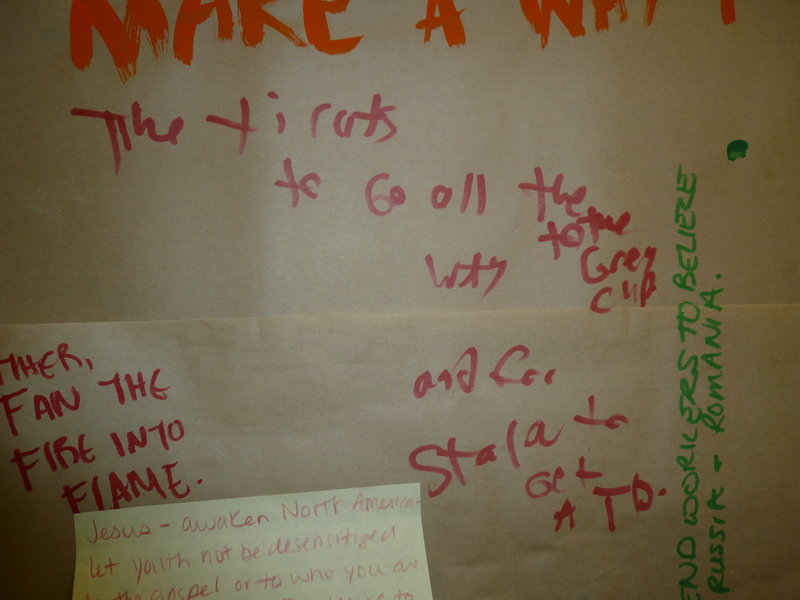 Some write prayers on the walls, others just ricochet around the space like pinballs. A young man in his mid teens lingers. He gets out his hockey stick and puck. “Sorry,” I say, “hockey in the hall, not the prayer room.” He gets another idea and hunts down a Monopoly game. “Do you have a table we can set up in here and play?” Again I remind him we are here for prayer. “You don’t have to stay all day if you’re bored.” “No, it’s ok,” he responds. “I don’t really like being at my home. 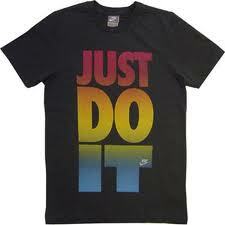 Here’s good.” He stays most of the afternoon, eventually writing down prayers for the Hamilton Tiger Cats on the walls. Got a break before my evening shift. I walk a few blocks south to visit a new friend I met at the prayer truck. I am greeted with gracious hospitality and served lovely tea and pie. “I made it in my electric frying pan, because my oven door doesn’t close,” she says. Another friend pops in, and we all pray together. I move on to my next errand. A couple streets over, I pick up the book I have to read in preparation for my Uganda trip in the spring. 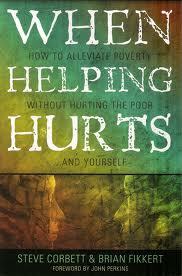 It’s called “When Helping Hurts ~ How to alleviate poverty without hurting the poor and yourself”. My friends aren’t home, but the book is in the mailbox. I sit on their porch for an hour, taking in the lovely autumn afternoon, devouring half of the book and amusing myself wondering what the neighbors think of strangers roosted on the porch. Tearing down the prayer room. I always feel so conflicted at this point. What to do with all the prayers people have poured out on the newsprint? I carefully photograph it all, then start ripping away. The whole thing comes down a lot faster than it went up! 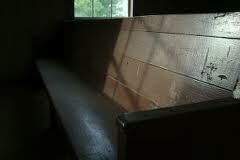 The room is then reset for it’s next incarnation – the headquarters of the church’s Out of the Cold program. I’m glad that prayer and loving service happen in the same place. I text a couple friends in my small group. Does anybody know how to fix an oven door? Find a handyman and set up a visit for tomorrow. 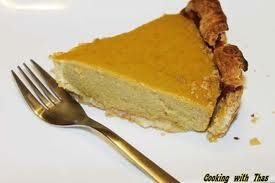 Maybe next week I can have pie cooked in the oven…. I’m sitting in a pew. It’s Wednesday morning. I’m happy. Content. Reflecting on the goodness of God. I have been in an accelerated season of personal healing and restoration. He has been pouring out His love and blessing in wonderful ways. The response startles me. A quiet voice. A scripture verse comes to mind, where Paul talks about being poured out like a drink offering of sacrifice and service. I pause for a moment. Then pray a dangerous prayer. Sing a dangerous song, actually. Just made one up on the spot. And something in heaven is set into motion…. Fast forward fourteen years. 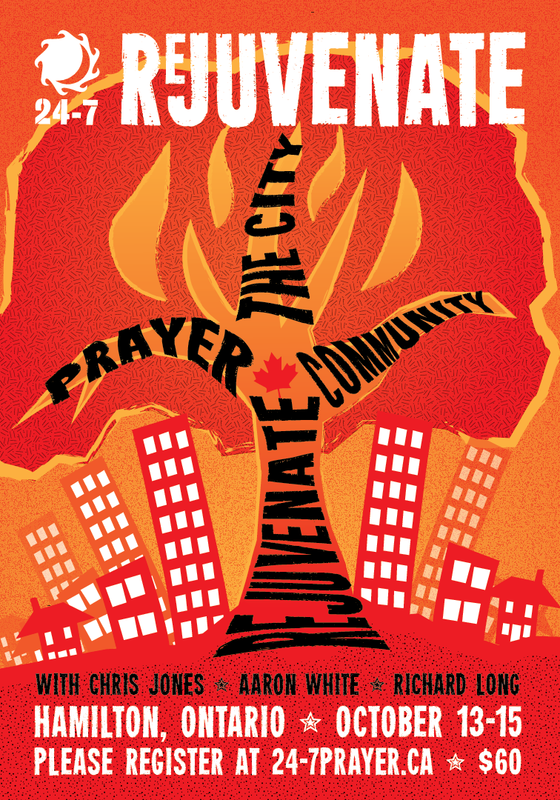 As we approach the anniversary of the Greater Ontario House of Prayer (GOHOP), I’m reflecting on my dangerous prayer, and God’s gracious response. I’ve been a prayer missionary (or monastery Abbess) for ten years. My life has indeed become a prayer and a song, and an offering. It’s been hard. Really hard. But inexpressibly wonderful and glorious. I don’t really have words, except to say that God has been good. More than good. Great. The other night I was with our small group, and we were reflecting on dreams that God has given us. “What’s yours, Jill?” they turn to me. Dangerous prayers. Risky adventures of faith. Living the dream.